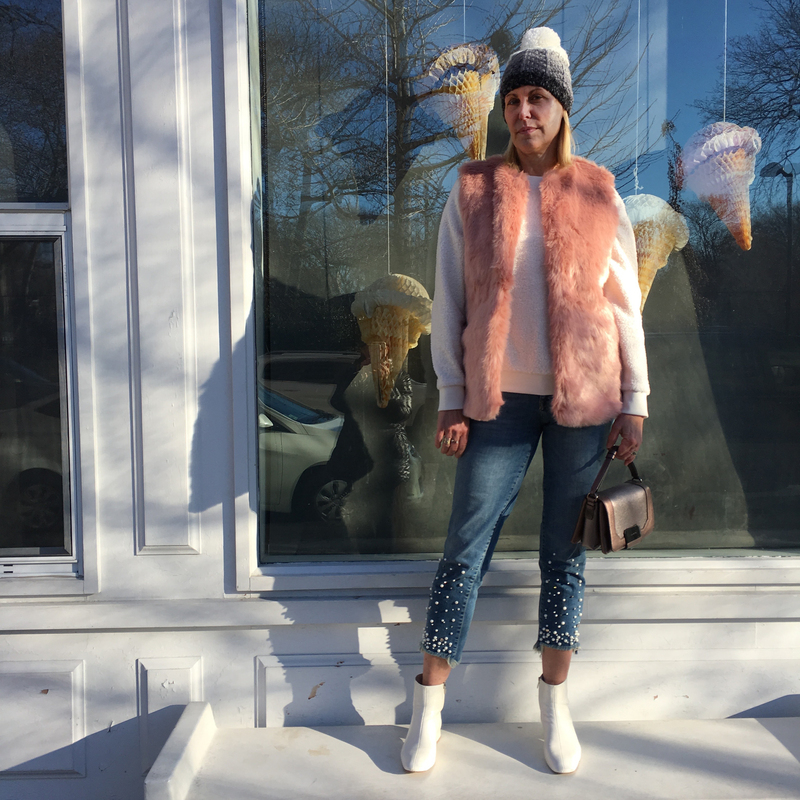 Faux Fur Vest: So pretty in pink, right? I’ve dressed it down here, but it would look great over a party dress when you’re feeling chilly. Or, for pure winter indulgence, layer it over your favorite PJs and get cozy with Netflix and a cup of cocoa — after all the presents are wrapped, of course. Best of all, this faux fur find comes in at under $35! Making it a great buy for your bestie, your sister, your daughter, and yourself! And, it also comes in black. Sherpa Sweatshirt: Not gonna lie, this top is so cozy I may have to go back and get one…or two more. It’s keeping me warm here in chilly JC, and it’s also got the potential to up my workout wear — especially if I’m going to combine going to the gym with running some errands. And it comes in lavender, pink and olive, too. A sweatshirt that’s anything but basic and a sweet deal at under $25. Besides yourself, I bet there’s someone on your list who’d love one. 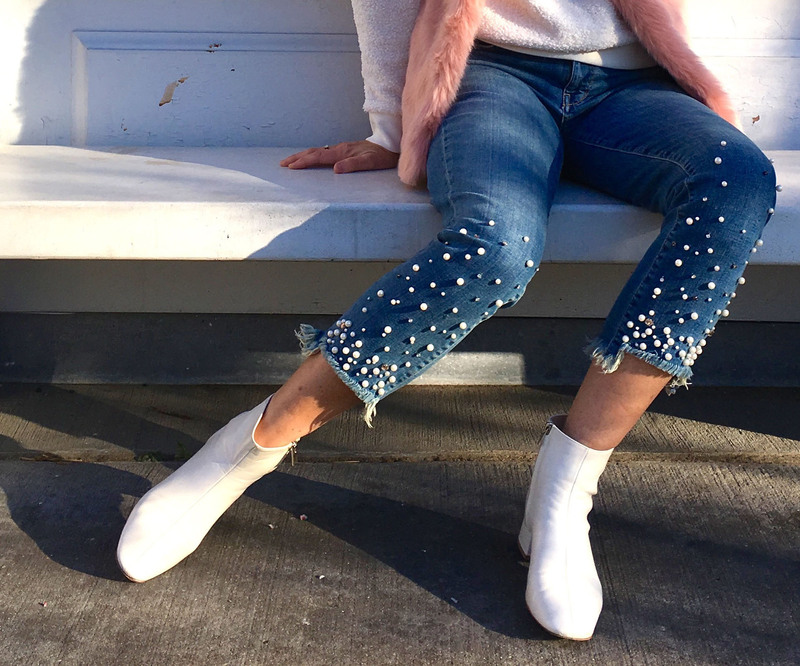 Embellished Jeans: Raise your hand if you live in jeans. I know I’m wearing them more days than not. And what better way to elevate everyday denim than with a sprinkling of pearls and gems? 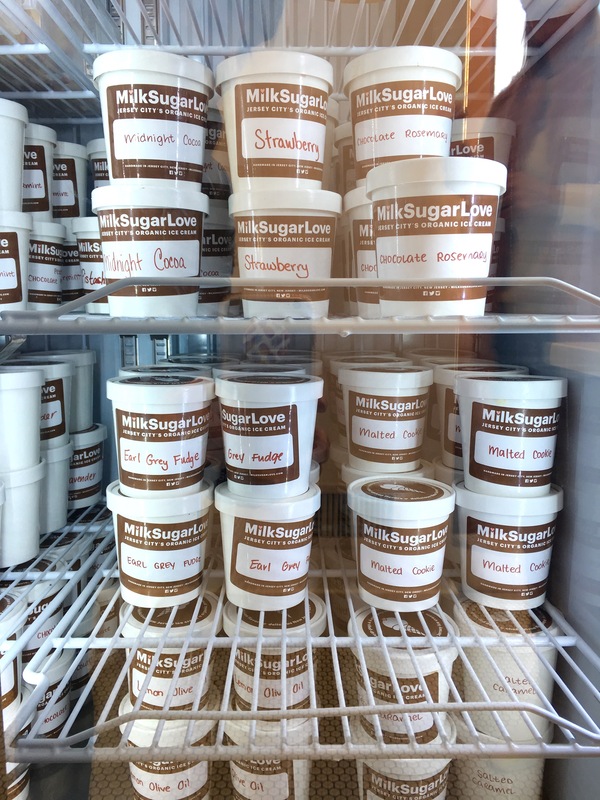 While my Pilcro faves are no longer available, I’ve found some irresistibly indulgent options. Someone on your “nice list” deserves a pair, don’t you think? Similar here (only $22!!! ), here (for petites), here (super sale!) and here (yup, super sale too!). Booties: If you don’t already own a pair of white boots, what are you waiting for? The fashion forward style, high quality craftsmanship and walkable comfort of these booties really can’t be beat. I did snag them when there was a flash sale, but not at the 50% off you can get them at now. 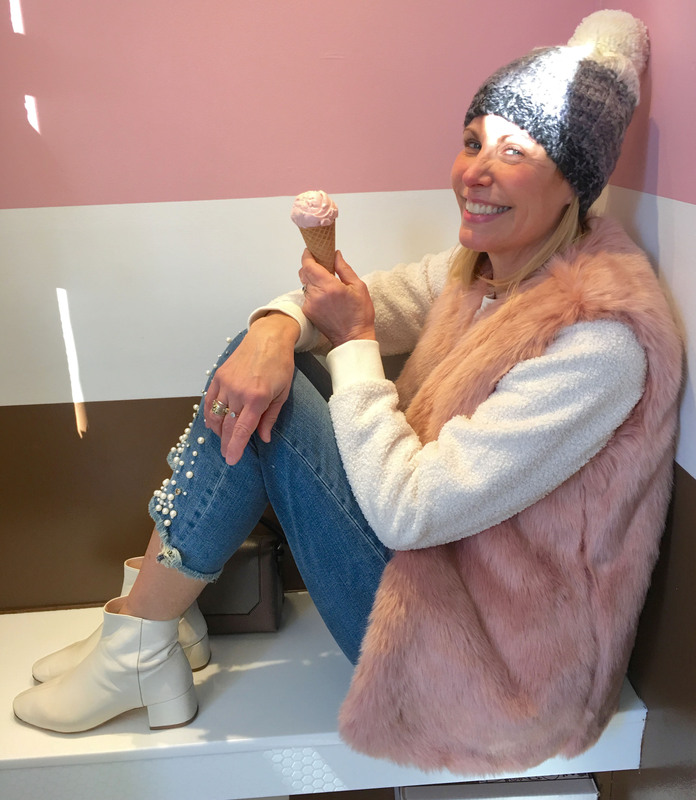 Honestly, these white boots are so great I may have to add another color to my shoe collection…stat. Want to wow the discerning fashionista on your lift? Gift her these! Two more affordable options here and here. Beanie: I grew up hating hats and being cold. Now, I love them. 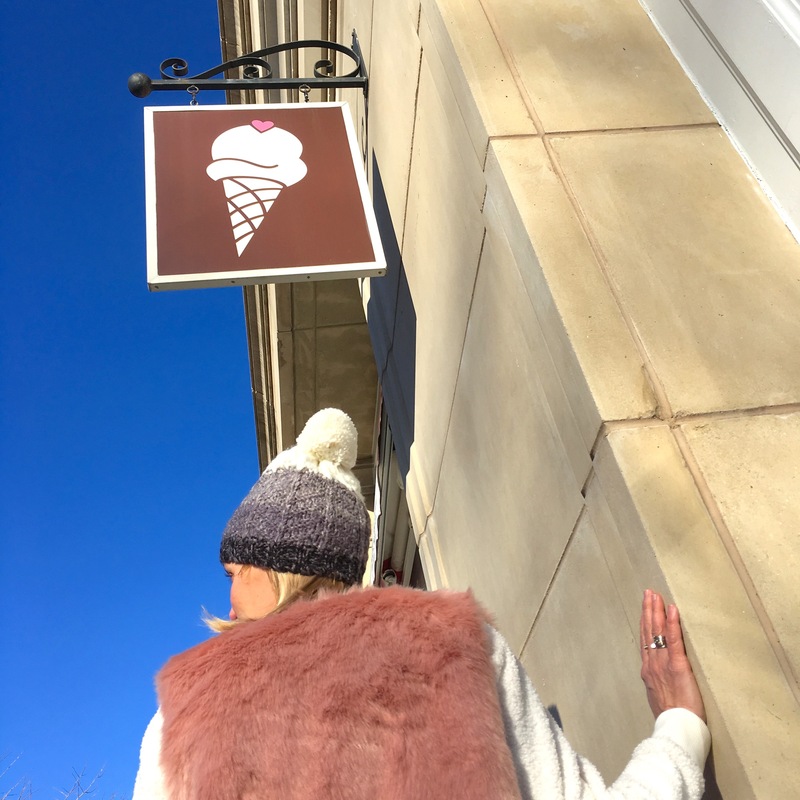 Not only is a fun beanie a practical accessory, it let’s you make an easy-on-the-wallet fashion statement. My ombre style is already sold out, but there’s no shortage of chic, colorful options out there. I think they’d all make super stylish stocking stuffers! Love this (40% off), this (just over $10!) and this (designer style at unbelievable savings). I’m headed to Los Angeles in 10 days (with Chris joining me on the 24th), and I do feel like the time to pull together all my gifting (and ship it out there!) is ticking away. I’ve also got to juggle styling/shooting/writing the blog posts I want to share with you. Put that all together, and it’s easy to feel that no matter how non-stop I make the days ahead, there is still not enough time to…get…it..all…done. 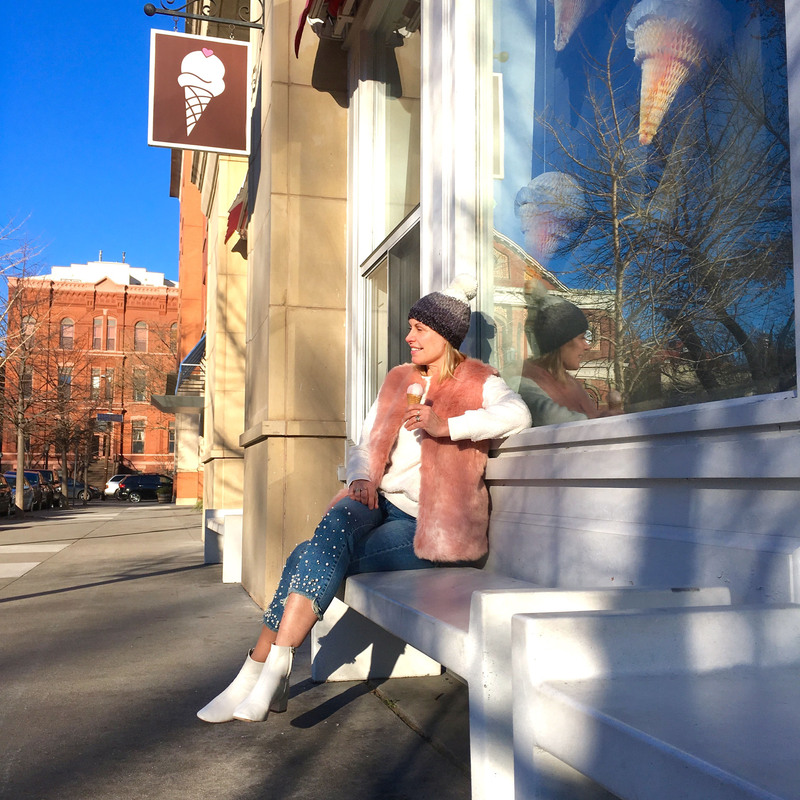 So every once in a while, I’ve got to remind myself to stop, breathe, and maybe eat a little ice cream. 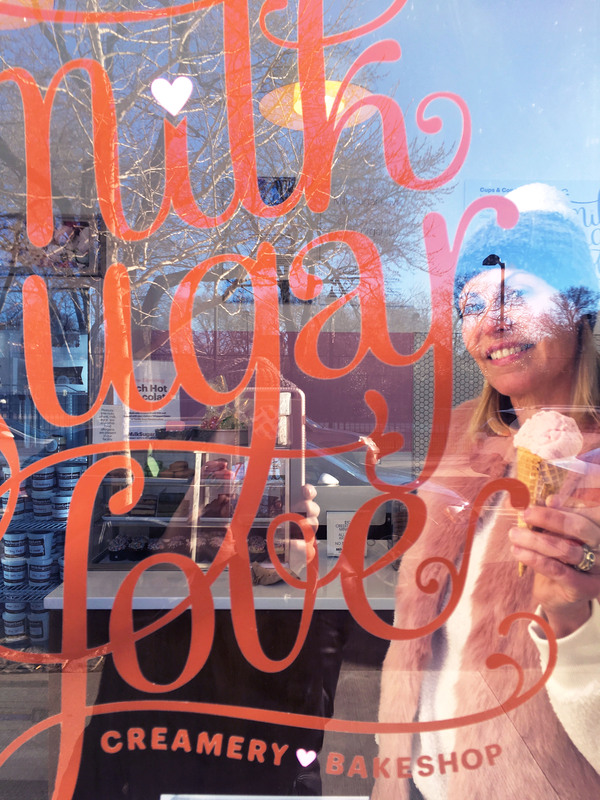 And when that ice cream is from Milk Sugar Love, one of my favorite Jersey City spots, any day can feel like a holiday. 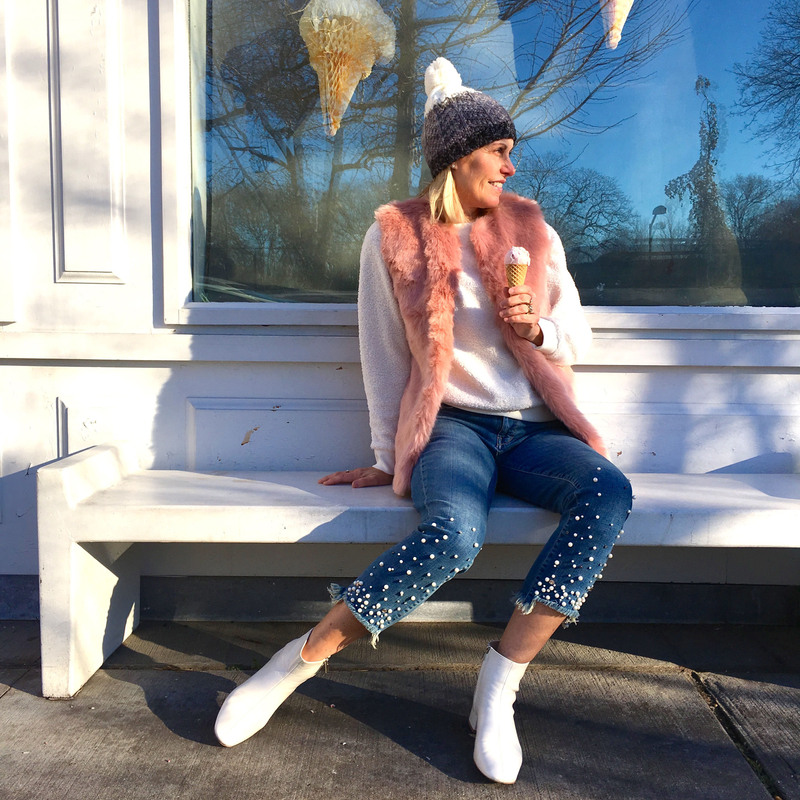 Sugar sprinkled jeans! So love your style! I want to go back for the Earl Grey Fudge. It’s one of my favorite flavors! Lemon Olive Oil too!! Thanks, Laurie! This season is tough enough on the wallet! !